Here is a photograph of the completed plaque for the Form of 1998. It was dedicated on June 1, 2013 and hangs in the Middle Dining Hall of Coit (The Upper) above the panels that contain the names of all the members of the Form of 1998. Below the photo is the description of the elements incorporated in the plaque design. The New Hampshire State House dome is the central image for the 1998 Form plaque, and represents the march by over 300 community members from St. Paul’s School to the State House lawn on Martin Luther King Day that year. The march was organized to encourage the State to add Martin Luther King Jr.’s name to the holiday, which was called Civil Rights Day at the time. 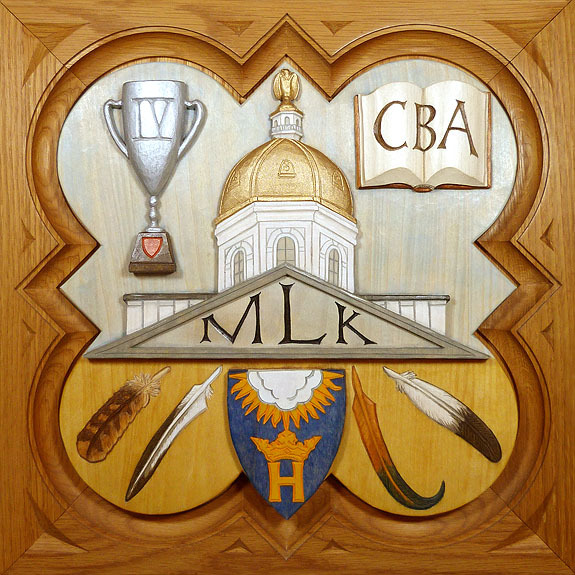 This is represented by the MLK initials carved in the tympanum beneath the State House dome. 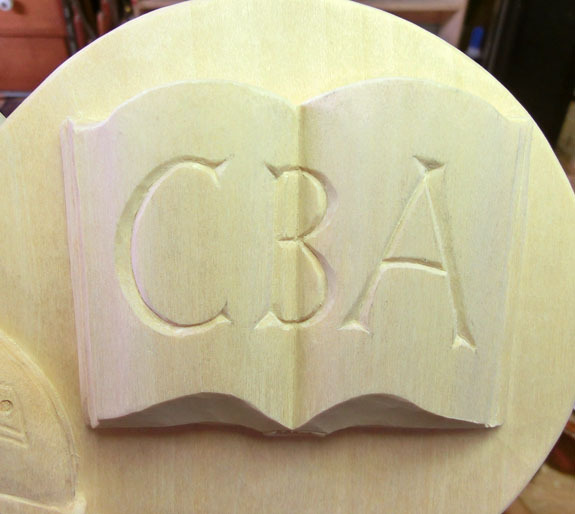 The upper right corner of the plaque features an open book with the initials CBA carved onto the pages, representing the beginning of the Rectorship of the Right Reverend Dr. Craig Barry Anderson, Eleventh Rector of St. Paul’s School. The book symbolizes the Rural Record, a journal of day-to-day life that was kept at St. Paul’s School from 1857 into the early 20th century. In the upper left corner is a trophy with the Roman numerals IV carved into it. This represents the four sports teams that won New England championships that school year – field hockey, wrestling, boys’ crew, and girls’ crew. 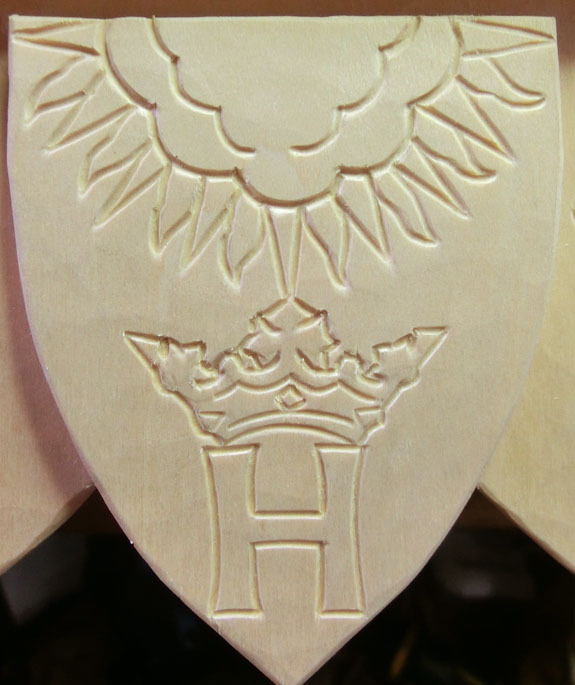 In the lower center section of the plaque a shield is carved featuring an element from the coat-of-arms from the Henley-on-Thames Town Hall. 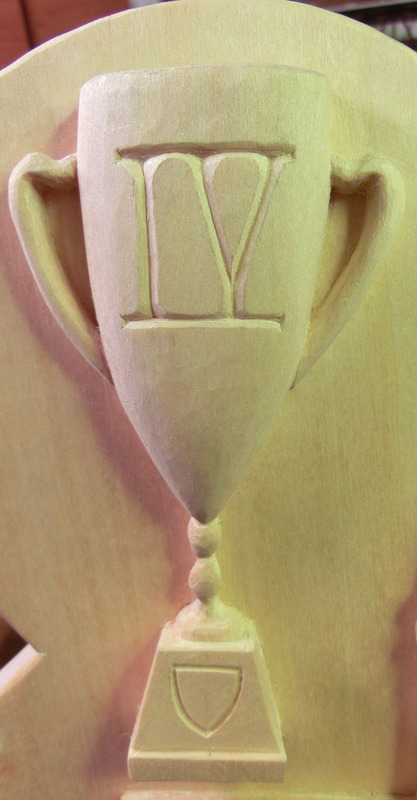 This represents the boys’ and girls’ crew teams’ trip to the Henley Regatta – where the girls’ team won the Peabody cup. The lower left and right sections feature four feathers representing each of the newly renovated Quad dorms. Each of the dorms has a stone carving on the building representing a different bird – an owl for Manville, a pelican for Simpson, a rooster for Brewster, and an eagle for Ford – the feathers in the carving are from each kind of bird. Anniversary 2013 Plaques are Up! Scott Russell from Carpentry hanging up the 1993 plaque. 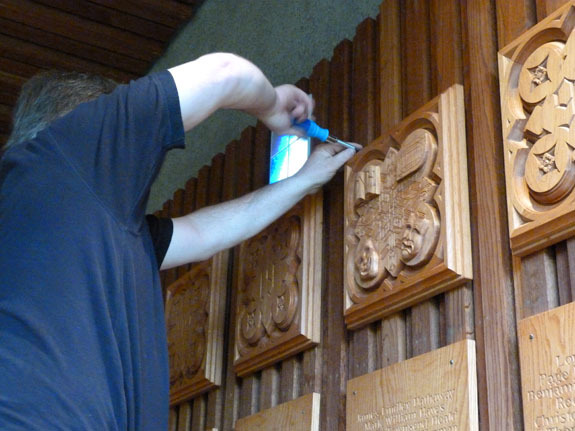 The Form plaques for the Forms of 1993, 1998, and 2008 are now hanging in the Lower and Middle dining halls. The Form of 2012 plaque will be on display in Middle dining hall in the Upper on Saturday, June 1st, at 1:30 pm, as part of the Anniversary weekend festivities. 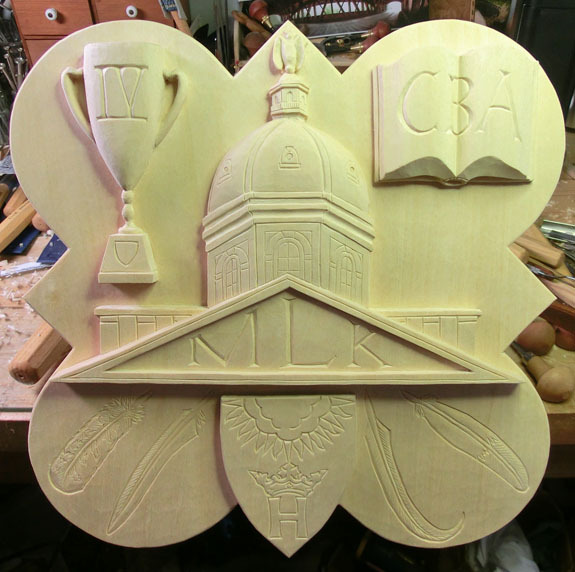 It will be hung in it’s permanent place next week when the finished date panels arrive from Art Swanson, who also is the carver of the name panels. I’m looking forward to meeting members of the Forms of 2012, 2008, 1998 and 1993 on Saturday – be sure to stop by the Upper to see your new plaques! The 2008 plaque hanging above the name panels. The 1998 Form plaque hanging above the name panels. The Form of 1998 plaque is now completed. The above photograph shows a sample of the painted finish on the plaque – the center portion showing the New Hampshire State Capitol dome representing the Martin Luther King Jr. Day march. The completed framed plaque will be revealed on Anniversary Weekend on Saturday June 1st – at which time photographs of the finished plaque will be published online. Thank you to the representative from the Form of 1998 for your help with this project – I am looking forward to seeing members of the Form of 1998 at the SPS Anniversary event to celebrate your new Form plaque! 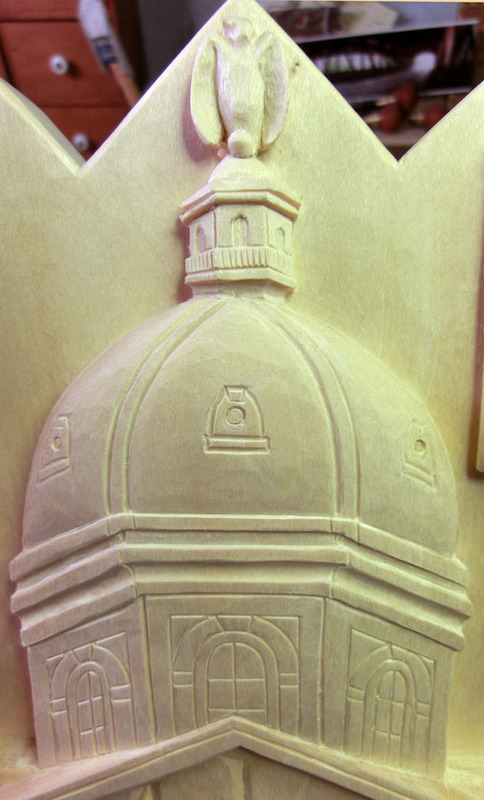 The center of the carving features the State House dome with the initials MLK in the tympanum. This represents the march from SPS to the State House on Martin Luther King, Jr. Day (which was then called Civil Rights Day) to encourage the addition of MLK’s name to the New Hampshire State Holiday. 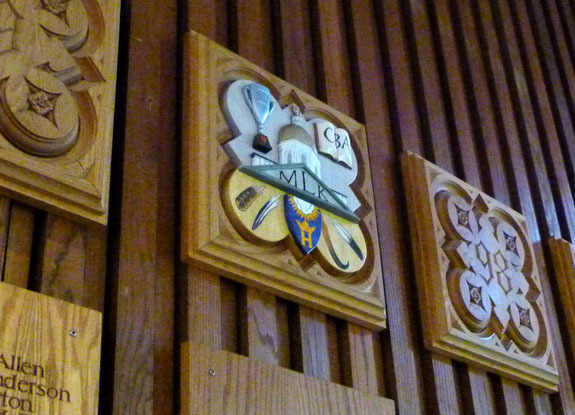 In the upper right corner features an open book with the initials CBA to represent the beginning of the Right Reverend Dr. Craig Barry Anderson’s term as Eleventh Rector of St. Paul’s School. The upper left corner shows a trophy with the Roman numerals IV representing the four sports teams that won New England championships that school year – field hockey, wrestling, boys’ crew, and girls’ crew. In the lower center portion of the plaque there is a carving of a shield featuring an element from the coat-of-arms from the Henley-on-Thames Town Hall. This represents the boy’s and girl’s crew teams trip to the Henley Regatta – the girls’ team winning the Peabody Cup. The lower left and right sides of the plaque feature four carved feathers – each representing one of the Quad dorms that were renovated and re-dedicated on October 3, 1997. Each of the dorms has a stone carving representing a different bird – an owl for Manville, a pelican for Simpson, a rooster for Brewster, and an eagle for Ford – feathers are shown from each kind of bird. 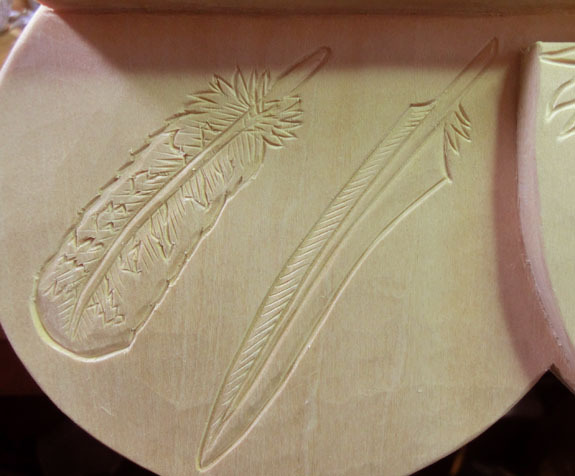 Once the carving has been sealed with a linseed oil finish it will be ready for the painting process to begin.Check back in a few weeks for a sneak peek photo of the finished plaque. Plaque designs traditionally incorporate one world news event and three to five School events. Center: Martin Luther King, Jr. Day – the march from SPS to State House to encourage the addition of MLK’s name to the State Holiday. 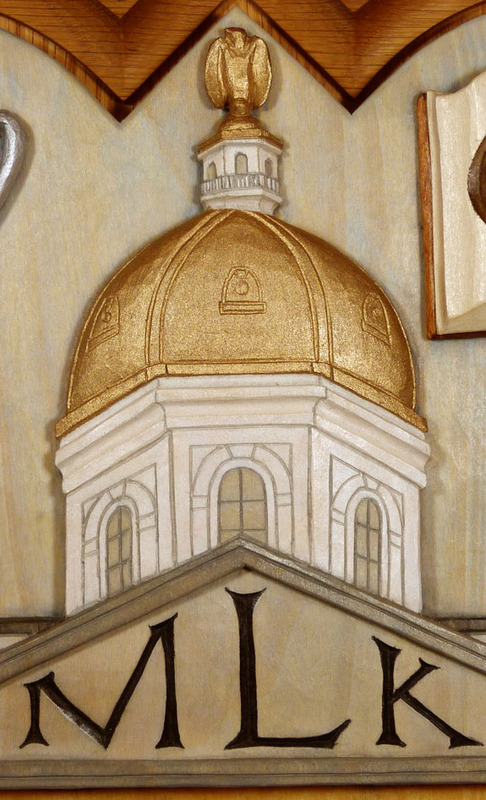 This is shown as the State House dome with the initials MLK in the tympanum. 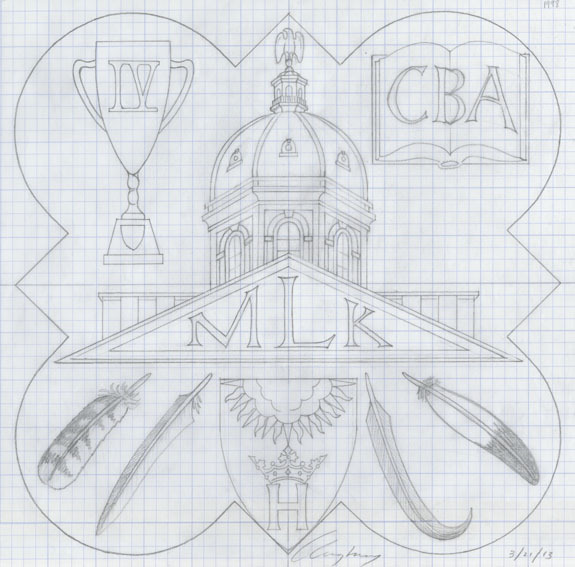 Upper right: An open book with the initials CBA to represent the beginning of the Right Reverend Dr. Craig Barry Anderson term as Eleventh Rector of St. Paul’s School. Upper left: A trophy with the Roman numerals IV representing the four sports teams that won New England championships that school year – Field Hockey, Wrestling, Boys’ Crew, and Girls’ Crew. 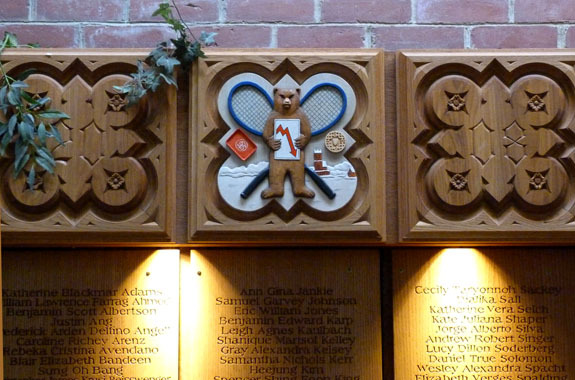 Lower center: A shield featuring an element from the coat-of-arms from the Henley-on-Thames Town Hall representing that the boy’s and girl’s crew teams went to the Henley Regatta – the girls’ team winning the Peabody cup. Lower left and right: Four feathers represent each of the Quad dorms that were renovated and re-dedicated on October 3, 1997. Each of the dorms has a stone carving representing a different bird – an owl for Manville, a pelican for Simpson, a rooster for Brewster, and an eagle for Ford – so feathers are shown from each kind of bird. 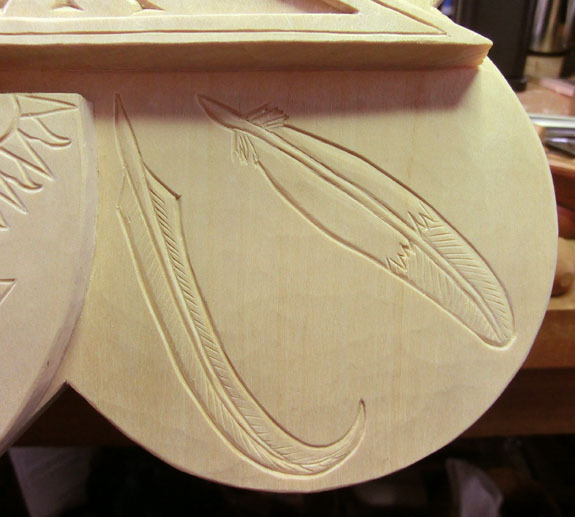 I will begin working on carving the plaque next and will post images of the carving as the work progresses.